Original Speks are 2.5mm magnetic balls that can help you reduce your stress or for your creative juices to flow. These magnetic balls come in a pack of 512 or 1000 balls, with your choice of 21 different colors and are a welcome injection of mindfulness and entertainment into your day. The original in mashable, smashable fun. Made from rare earth magnets in a rainbow of colors, Speks are quite possibly the best stress-relief desk toy around (#humblebrag). Take ‘em wherever you like — they’re the perfect size for work or on-the-go. Bring a dose of zen wherever the day takes you, whether the boardroom to the dorm room, or somewhere in between. Choose from a range of fun colors and build, mold, sculpt, and engineer limitless shapes and structures. Then mash ‘em up and start all over again! It is not exactly high technology. However, I find it an interesting tool to drain stress. Very common affection today .. These are pretty cool. 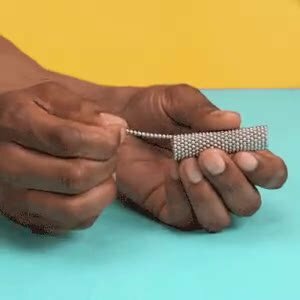 If you tend to fidget, this gives you something to occupy your hands with and calm you down if you're a little nervous. If the magnets can change colors automatically, that will be awesome, sadly it doesn't have that capability. WOW what an idea to relieve your stress and to feed your creativity! The modern times man is more stressed and thus requires more of such creative and innovative ways to release it. I really wants to give a big thumbs up to anyone who created this product.